"The ‘Keep it, Bin it’ campaign is a bold statement of our intent to tackle the scourge of littering. Littering is antisocial and unacceptable. It plagues our environment and poisons our wildlife. "We know we won’t achieve this ambition by working alone. That’s why I’m thrilled to see some of our biggest companies including Mars Wrigley Confectionery, Greggs, and McDonalds and the tireless campaigners at Keep Britain Tidy, joining forces with us to help improve our precious environment." "We are delighted to be partnering with Defra to deliver the first government backed national anti-litter campaign in a generation. As the largest consumers of food and drink on the go in Europe the need for this campaign has never been greater. We are urgently asking everyone to eliminate litter by keeping their packaging with them when there isn’t a bin and bin it when there is one. "We know the impact that litter has on our environment, on wildlife and, ultimately, our oceans where 80% of the plastics found there come directly from the land. "This campaign will raise awareness with those people who still think it is acceptable to leave their rubbish anywhere other than in a bin. "The message is simple – Keep it. Bin it." "Mars Wrigley Confectionery is hugely proud to support the national anti-litter campaign, as it builds on our long-standing commitment to tackling this important issue. 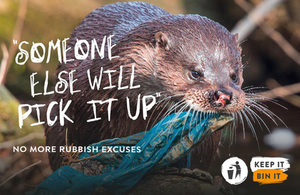 "We feel strongly that industry has a critical role to play in delivering long-term behaviour change by encouraging people to bin their litter responsibly and we look forward to working with the team at Defra and Keep Britain Tidy to deliver on this goal." "We love that our customers care about the environment, and so do we - that’s why we’re committed to doing all we can to protect it and tackle the growing issue of litter. "Social responsibility forms the bedrock of our business and to this end, we have rigorous targets in place, ensuring we carefully manage any environmental impact from our operations. We are proud of our existing partnerships with a number of environmental charities including Keep Britain Tidy and look forward to working with Defra and other campaign partners to really bolster all of our efforts in this area and make a positive impact together." "As a business we have made a number of moves to help reduce our impact on the environment. These include introducing recycling units in our dining areas, reducing the amount of packaging we use and moving our plastic straws behind the counter, whilst we move to paper straws, which has reduced the number used by almost 10%. Our restaurant teams have also, for over 30 years, carried out daily litter patrols in their local area, collecting all the litter they find. "We are proud to now be supporting the ‘Keep It, Bin It’ campaign. As a father of two boys, I am passionate about the responsibility we have to ensure our communities are clean and our natural environment remains healthy for future generations."